Last month, I convinced a friend to come with me to an exhibition, Baldessari Class Assignments (Optional), at California College of the Arts’ Wattis Institute of Contemporary Art. Before I had a chance to visually make sense of anything in the exhibition I was greeted by an overpowering sweet smell of vanilla and pastry. 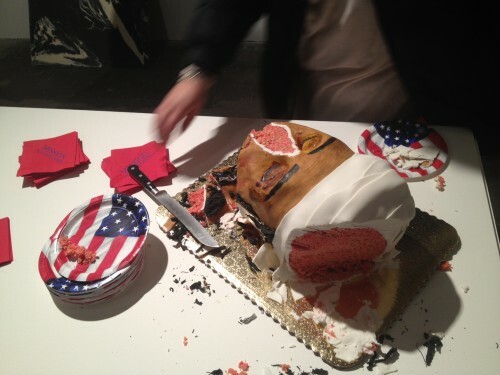 The source was in the center of a huddled mass of giggling persons eating something on a pedestal; upon closer inspection what was revealed was a half-eaten head of Osama Bin Laden—served with American-flag cake plates and red cocktail napkins with violet lettering spelling out “MISSION ACCOMPLISHED”, along with a red-stained chef’s knife. Another disturbing factor was the gleeful smiles of people eating large slices while urging others to have some of Bin Laden’s symbolic head. Cannibalism came to mind and the ritual of consuming a Eucharist, the symbolic flesh of Christ, for Holy Communion during Sunday church service. This outright incriminating meal cloaked in a thin veil of innocence touches on levels of bloodlust, political apathy, and entitled pleasure. 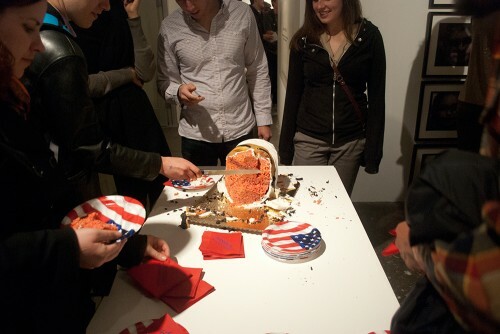 To the credit to the artist who created the Bin Laden cake I give Em Meine the stage to explain why she did it. Charlene Tan: Please give me a small introduction of yourself for the OpenSpace readers. Em Meine: Originally from New Jersey, I moved to San Francisco in August from New York City to attend the California College of the Arts, where I am currently pursuing an MFA in studio practice. Much of the work that I am making now addresses failure and inadequacy through the lens of humor, paradox, or sarcasm. The cake I made for the exhibit Baldessari Class Assignments (Optional) at the Wattis Institute for Contemporary Art is my first foray into edible, participatory art. EM: The prompt I chose for the Baldessari Class Assignments project was #49, Disguise an object as another object. 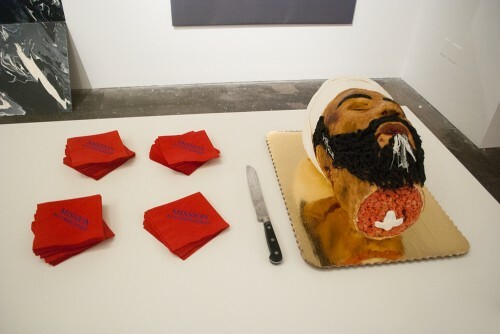 The severed head of a known terrorist is not something typically translated into confectionery form, and so to disguise a cake as bin Laden’s head (or vice versa) seemed appropriate to both Baldessari’s sense of humor and my own. CT: Why did you just make the head instead of the whole body in the same fashion as Marina Abramovic’s cakes for MOCA’s gala? EM: With this work, the cultural context I drew from is inspired more by art historical references like Caravaggio’s Judith Beheading Holofernes than with modern works addressing the spectacle of the body. I think Abramovic’s 2011 MOCA gala was problematic for a number of reasons, first and foremost for those Yvonne Rainer and Sara Wookey called attention to. The full body cakes of Marina and Debbie Harry were to me more about commodification of the body – in this case the artist was transforming herself into a product, made by a company, Kreëmart, for consumption by customers, who in this case were MOCA’s donors. Mission Accomplished is intended to reference historical narratives of beheading the enemy, calling for an opponent’s head “on a silver platter,” etc. and therefore having bin Laden’s full body represented in the gallery space was unnecessary. I did not want to produce a funereal experience for a cadaver, but rather touch upon classical cultural and art historical references while keeping the piece clearly in the vernacular of celebration, calling attention to how repulsive that celebration might be. CT: Was it intentional to make the eating of the head communal cannibalism? EM: I was living in New York last May when it was announced that Osama bin Laden had been killed. The public celebrations that took place at Ground Zero and in Washington, DC were confusing to me and somewhat appalling. 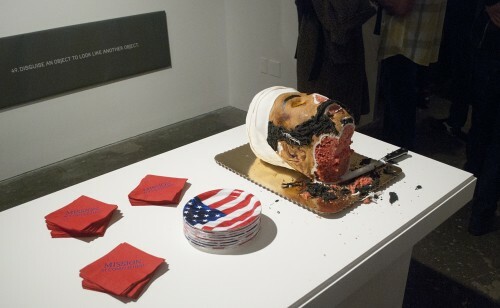 The cake was my way of challenging people to participate in a very visceral celebration by consuming an overtly gruesome representation of bin Laden. I was interested in seeing whether an audience would make a distinction between flag waving and cheering and celebrating in the streets, and the active consumption of an effigy in a party-like atmosphere. As with much of my work, there is a tongue in cheek sense of humor to the piece which I hope resonated with the audience as they ate pieces of Rice Krispy Treats off of “Mission Accomplished” napkins. It was a pleasure for me to watch people simultaneously be repulsed by the cake while still cutting into and eating it with what looked like guilty joy. CT: Do you see yourself expanding on this work? EM: I am continuing to explore the boundaries between the traumatic and comical in the way that Mission Accomplished attempts to do. At this point I am not working on any other edible works or pieces addressing bin Laden’s death, but I am always interested in keeping a critical eye on what is going on in society at large and exploring how I can mine popular American culture for inspiration or subject matter for my work. I am turning my attention right now to examinations of cultural assumptions, and exploring ways to subvert those ideas. Mission Accomplished was the first work I’ve made that required audience participation in order to activate the piece and I look forward to making more works that draws on audience involvement in the future.